I have had my Cath Kidston cottage sewing basket for quite a while now, and since I do use it very regularly it has started to show signs of wear as bits are slowly falling off. 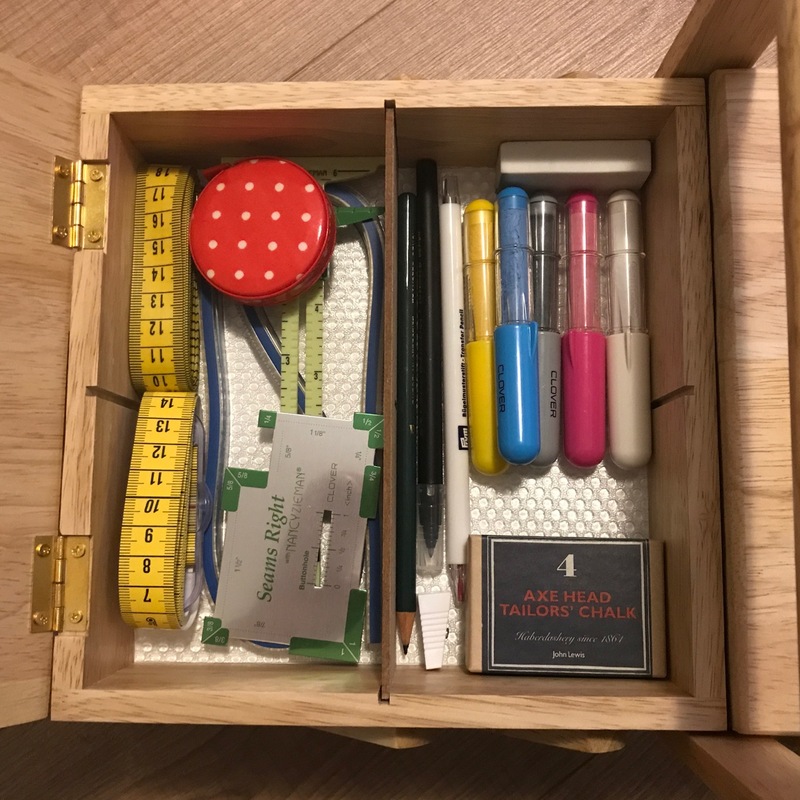 I had actually already outgrown my sewing basket as there was simply no room anymore and had to store items in different places. 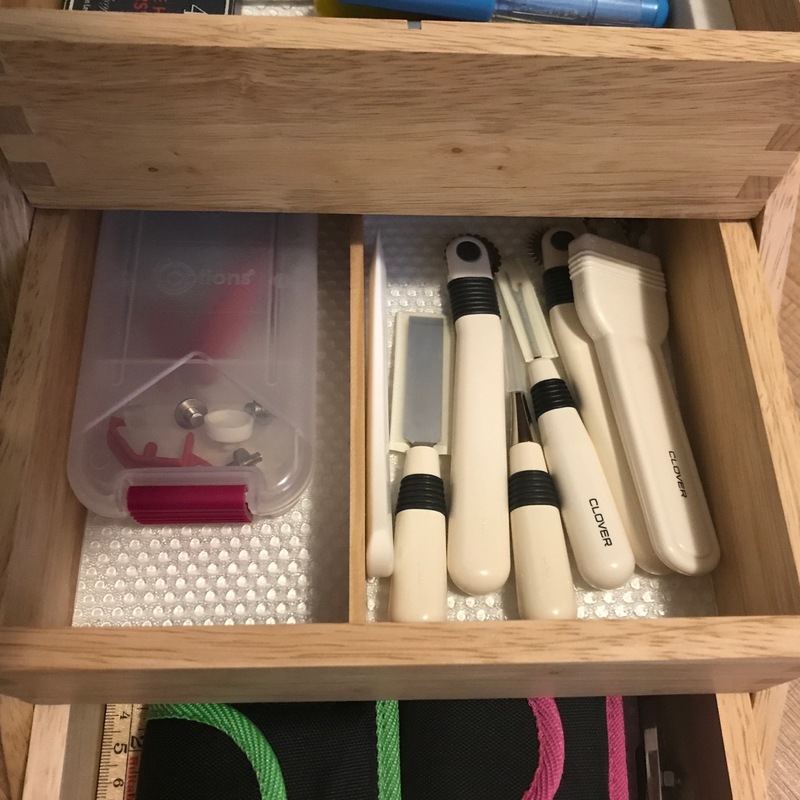 My embroidery tools and my knitting & crochet tools have multiplied so much over the past few years that they have even ‘earned’ their own storage. I always fancied one of those old-fashioned wooden concertina sewing boxes but I never found one that I really liked. Most of them have a thick coat of varnish, fabric inserts I didn’t like or too many carved details. Last month, I spotted a more modern looking model at my (reasonably) local fabric shop. However, I thought I would leave it for the moment, as it seemed like a nice Christmas present I could ask Santa for. Yesterday my boyfriend and I went to said fabric shop to choose fabric for our new bedroom-curtains, which I am going to be making myself (with the help of my mum I hasten to add). I couldn’t resist walking past the sewing box display and when I mentioned the box I liked my boyfriend said he would buy it for me! The sewing box I picked is by Prym (article no 612548). It is made from a light rubberwood. I have the largest size and it measures 45 cm by 28 by 23 cm. They also have this particular style in small (36*22*19 cm) and medium (36*28*19). All three sizes are also available in a darker wood. The box is very sturily and beautifully made with dovetail joints. The rubberwood has a slight gloss but is not overly shiny. The top compartments have flexible partitions, which can be removed. On one side I kept both, and on the other side I only kept on. In the two middle compartments as well as in the top compartment I added partitions of my own. I used some 35 mm by 7 mm moulding left over from my previous DIY project, sawed it to size, and glued it in place. The bottoms of the various compartments are white and glossy which means that your tools don’t stay put. 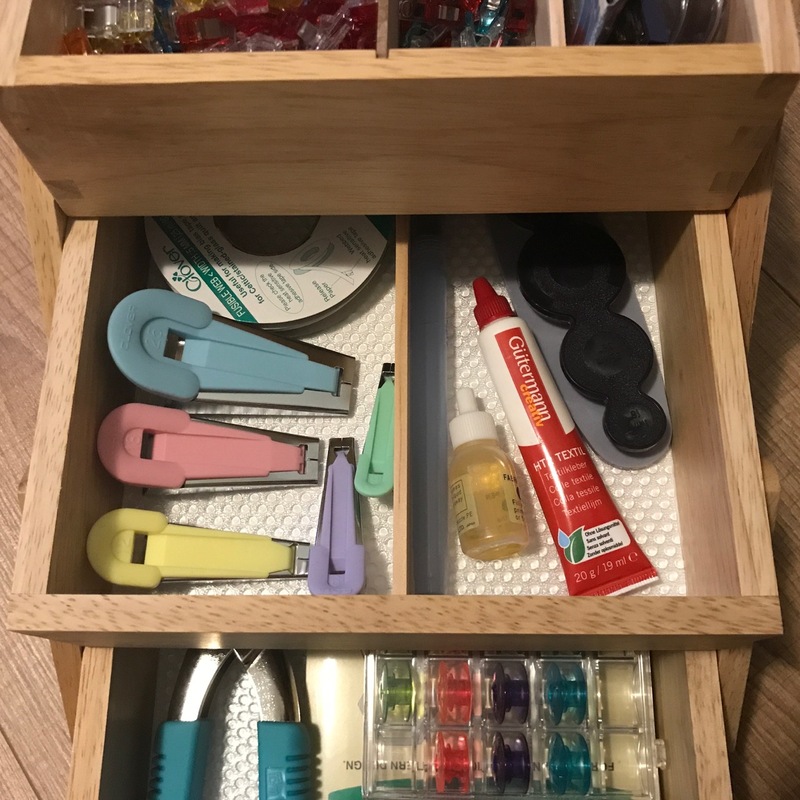 To protect the inside of my sewing box and my tools I bought the plastic Variera drawer mat from Ikea and cut it to size for the various compartments. This way all of my tools will stay put. The bottom of the compartment which stores my Clover wonder clips and my pins and needles I covered in a Besta drawer mat also from Ikea. This mat is made from grey felt and ensures that the clips and pins don’t rattle about in the box. 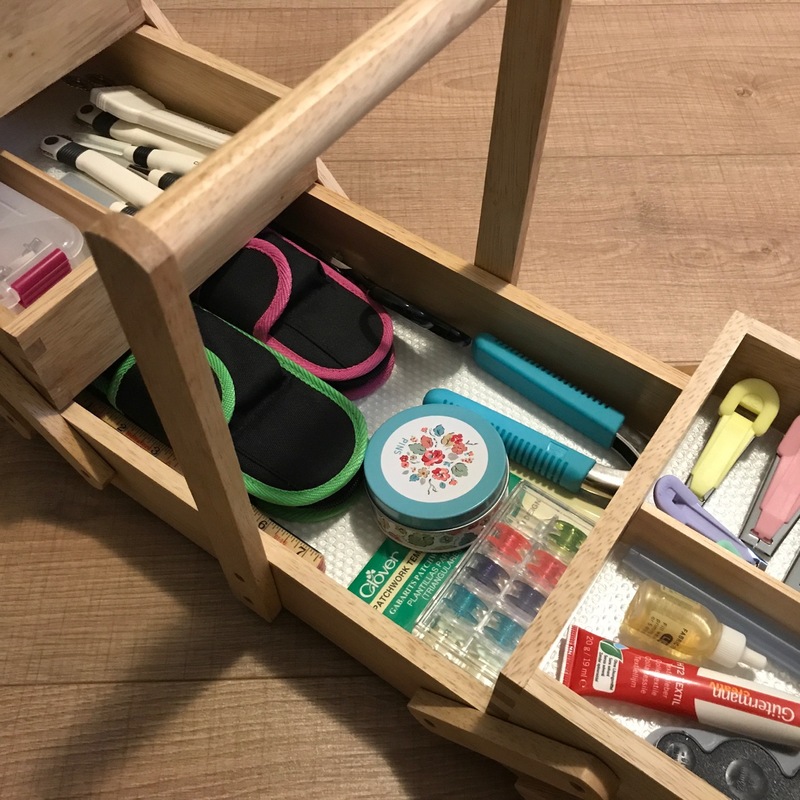 I love how all of my sewing tools are in one place now and that my new sewing box looks so organised! It think this box will definitely last me a while. So happy with my present! In a next blog post I will write a little bit more about the contents and share my top-5 sewing tools. In case some of you are wondering where my sewing threads are. I have always stored them separately as you never need all of your threads at once for a project. To store them I use the Slimline Storage box from Sulky . It is made for their snap-end spools but fits 200 m spools by Amann-Mettler and Gutermann as well. This is a great box as you can easily see which colours you have and match them to your fabric. I love how you organize your supplies. I have wooden sewing basket that I bought from the flea market. My dad is fixing the wood for me. Mine is a darker wood (I like wood that reminds me of chocolate ^_^) and has legs and a handle at the top. Thank you Dima! Lucky you that you found a sewing basket you liked at a flea market. I like flea markets but I never seem to find the best buys. I was thinking about putting some legs on mine so I doesn’t need to sit on my table. I know, it’s really addictive trying new storage methods! I wonder what I end up getting at the K&S show this year! I should try and invent my own! 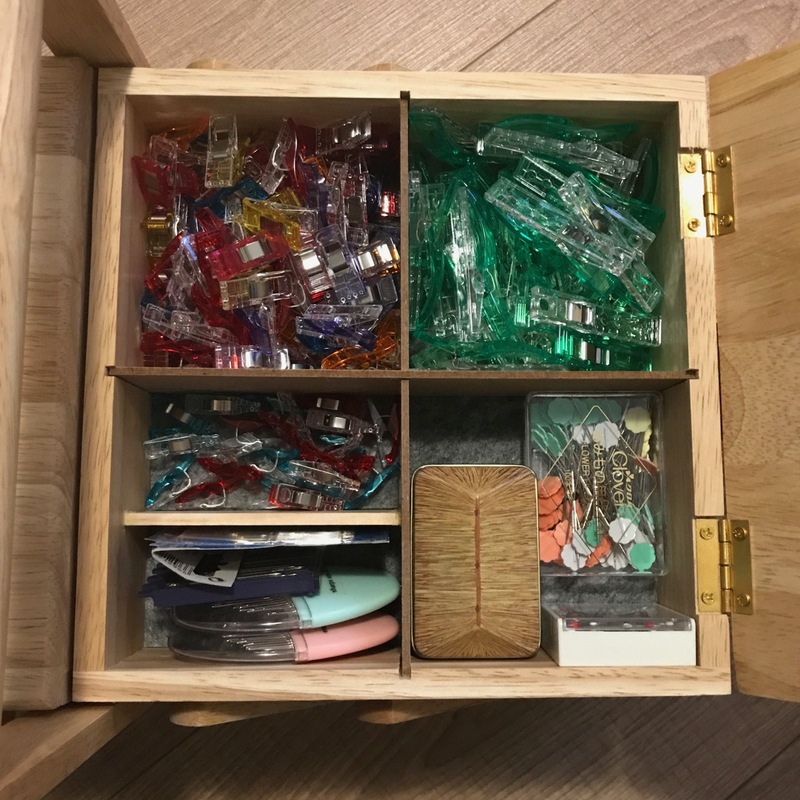 I could not show my sewing box as it is in such a mess – I am not the most organized! But you look very organized! Thank you! I hope I can keep it tidy though! It’s always interesting to see how other people manage their equipment.